Please come to voice or show your support of the trail. WalkBikeBerks is working to support the Berks County Planning Commission and their Bicycle and Pedestrian Plan. The Berks County Planning Commission's Michael Golembiewski and Lorri Lencheski will discuss how local communities can incorporate the Berks County Bicycle and Pedestrian Master Plan into Subdivision and Land Development. Please join WalkBikeBerks before May 13 so that you are able to attend this special event. The word "greenway" means different things to different people. Since the 19th century, "greenway" has been used to describe a variety of linear corridors across the land that conserve natural areas and provide people with recreation and transportation opportunities. Often greenways are associated with off-road trails, such as the Appalachian Trail or the Pine Creek Rail-Trail, although not all greenways include trails. 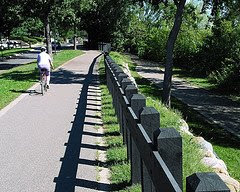 There is a growing national movement to promote greenways, especially since 1987 when the President's Commission on American Outdoors recommended establishing a national greenways network. A greenways network is similar to a roadway network, which connects all kinds of destinations through a linear system. However, a greenways network is designed for recreation, conservation, and smart land use - a network for people, nature, and "livable" communities. Greenways are often established and managed through partnerships between municipalities, counties, and non-profit organizations. Pennsylvania's statewide Greenways Program was established by the Governor in 2001 to promote and support the many local and regional greenway efforts in all 67 counties. The vision is to create a network of greenways throughout the Commonwealth, with a greenway in every community by 2020. To Learn More, Please visit: http://www.pagreenways.org/greenways101.htm. Thank you for your participation in the WalkBikeBerks Logo Contest. We are impressed with the quality of art submitted. Students of all ages entered the contest. Some presented brilliant concepts. Others were sure to add color and unique design components. Everyone clearly worked hard to consider the mission of our organization and design a logo that we would be proud to display. We will only be able to select one logo as our first place winner. That artist will receive the Bicycle generously donated by SPOKES Bike Shop, Hamburg. Two other 'honorable mention' recipients will be awarded New Bike Helmets contributed by LEBO's of West Lawn and J.B. Mountain Bikes of Shillington. Please keep visiting our blog to see the winning LOGO. Over the next few months, we will highlight a different artist's submission, so be sure to watch for your own design. By-laws – Budget Adoption? Amendment? Route 422 as an economic corridor? To adopt National Complete Street Policies, we need to first elect officials who value walking and biking as modes of transportation. Today, excercise your right to vote. Don't Forget EARTH DAY! Walk, Bike, Carpool, or Take the Bus to the Polls. All Pennsylvanians who registered by March 24th and who are 18 years of age are eligible to vote. Polls are open from 7:00 a.m. to 8:00 p.m. All voters in line at 8:00 p.m. have the right to vote as long as they remain in line. Only people who are voting in an election district for the first time must show identification. Approved forms of identification include a valid driver's license, passport, student ID, employee ID, voter identification card, current utility bill, current bank statement, paycheck, or government check. Berks County, PA - Presidential candidate Barack Obama will hold an “On Track for Change Town Hall" at Reading High School Sunday. Doors to the gymnasium in the Geigle Complex will open at 10:30 a.m., with the event to begin at about 12:20 p.m. Tickets are required and available free first come, first serve at Obama’s campaign headquarters at 352 Penn St. after 6 p.m. today. You’ve made the decision to buy a bike. Now it’s time to start seriously gathering information on how to select the best style for your needs and get a good fit. Here’s some tips that will help you purchase the right bike for your needs. They used to be known as the "ten-speed," however road bikes now range from 12 to 21 speed. Within this category of bikes are touring, racing, and sport bikes. This bike is not built for speed, rather, it’s designed to provide comfort for the long haul. A touring bike is an excellent bike for long distance riding. The drop handlebars provide comfort, good control and allow for multiple hand positions. Twenty one speeds will take you over any type of incline you’ll encounter and cantilever brakes can stop you even when you’re heavily loaded down. This bike is built for speed, sporting an aerodynamic, thin and ultralight frame. A short wheelbase allows the bike to respond to the slightest movements and 12 or 18 gears will get you, and keep you, at top speed. If you’re into winning races, this is the bike for you. This bike falls between the touring and racing bike. Not as light as a racing bike but more responsive than the touring bike. The sport bike’s drop handlebars provide comfort and control and the aerodynamic design allows for faster speeds. If you’re into taking rides of 10 or more miles while turning up the intensity by adding some speed, this bike can take you there. Mountain or All Terrain Bike. This bike is rugged. Built with a sturdy frame, straight handlebars and fat, knobby tires, it can tackle the rigors of off road riding. The upright riding position on the bike makes it comfortable while giving you leverage for steep inclines. This bike is a cross between the road bike and mountain bike. It’s lighter than a mountain bike, but not as fast as a road bike. Straight handlebars, medium-width tires, 21 gears, and upright riding position makes the bike perfect for short distances, running errands or commuting. Once you know which type bike you want, make sure the bike you select fits you properly. There’s essentially two ways to accomplish a good fit. If you want a perfect fit, for about $50, have a quality bicycle shop calculate your bike size using a computerized program called the Fit Kit. They’ll take various measurements such as, length of your legs, torso and arms then give you a printout of your measurements and which frame height and length best suits your body. Straddle the bike. You should have one to two inches of clearance between the top bar of the bike and your crotch, three to four inches if you’re going to be riding on off-road terrain. If you want to be a little more exact, measure your inseam, straddle the bike, pick it up until the top bar touches your crotch, then measure the distance between the bottom of the tires and ground. Be sure when you sit on the bike you can comfortably reach the handlebars. If the handlebars are too far away you won’t have adequate control, if they’re too close you’ll be uncomfortable and tire easily. A quality bike shop will make the necessary adjustments for you to fine tune the fit of the bike. A critical adjustment is seat height. Your knee should have a 25-30 degree bend when the ball of your foot is on the pedal at its lowest position. The handlebars should be one inch lower than, or the same height as, the seat. Check to be sure you can comfortably reach the brakes and that the width of the handlebars are approximately the width of your shoulders. Just like purchasing a car, this is where the rubber meets the road. You should feel comfortable and in control. Your elbows should be relaxed with a slight bend and squeezing the brake levers should be easily accomplished. Slide your rear back off the saddle, stand up on the pedals, flex and round your back, and move your hands to various positions on the handlebars to assure you can move around on the bike easily while it’s in motion. Once you select the bike to purchase, you’ll want to get some accessories to go with it. Most important is a helmet. You may also want to consider a tire pump, tube repair kit, pressure gauge, seat pack, water bottle and cage and a lock. The bicycle shop can help you select these and install them on your bike. Depending on how much you spend on your bike, you may be able to convince the salesperson to throw in some of the accessories at no charge. Join Hillary for a "Solutions for Pennsylvania" Rally in West Lawn -- and ask the candidate to adopt S. 2686 and H. CON. RES. 305 and recognize the importance of pedestrians and bicycling in transportation and recreation. When you become aware of other public appearances for candidates in our county, please share them with walkbikeberks@yahoo.com. We will be happy to post them on our blog...to invite our members to attend and speak on issues important to us. Today, Adam Crosier will step out into a world that is familiar yet altogether foreign. Crosier of Exeter Township is starting his attempt to walk the entire length of the Appalachian Trail — 2,175 miles from Georgia to Maine. He will begin this morning on Springer Mountain on terrain he’s never walked before hoping to reach Maine by mid-September. First Prize: A New Bike! Thank You SPOKES, LEBO'S, and JB Mountain Bikes! Your generous support of our organization is sincerely appreciated. We are inviting you to design our logo. A logo is a design used by an organization on its letterhead, advertising material, and signs as an emblem by which the organization can easily be recognized. It is a picture or symbol that will represent us. For example, Target's logo is a red and white 'target'. Pepsi's logo is a red and blue circle with a white swoosh through its center. Please ask your teachers and parents to show you other examples. Remember: Our logo must be unique and represent WalkBikeBerks. The mission of WalkBikeBerks is to make walking and bicycling practical, convenient and safe transportation and recreation options for all citizens of and visitors to Berks County, Pennsylvania. To learn more about us, please visit: http://walkbikeberks.blogspot.com/. One of the projects of WalkBikeBerks is to help schools develop Safe Routes to School Programs to encourage children to walk or to ride a bicycle to school. You can learn more about the Federal Safe Routes to School Campaign by visiting: http://www.saferoutesinfo.org/. Deadline: April 28, 2008. Entries should be submitted on the reverse side of this form. This form may be reproduced to make as many copies as necessary. Entry must be no larger than 8” x 8” and no smaller than 4” x 6”. The first place prize has been donated by SPOKES Bike Shop, Hamburg, PA. It is a comfort/hybrid bicycle that they will adjust to meet the winner (size/type) at a retail cost of $330. Other prizes have been donated by LEBO'S of West Lawn, and JB Mountain Bikes of Shillington. All entries must be postmarked on or before April 26, 2008. The contest is open to all school-age students in Berks County. Only one entry per student will be accepted. All entries will become the property of WalkBikeBerks, and cannot be returned. Your picture cannot have any copyright or trademark symbols on it. Entries will be judged by WalkBikeBerks. All decisions are final. WalkBikeBerks reserves the exclusive right to authorize the reproduction of all entries in any form. No cash substitutions, transfers or assignments of the prize are allowed. All or any taxes are the sole responsibility of the winners. Only one prize per household. Winners agree that by accepting a prize each winner waives all liability against WalkBikeBerks, its members, sponsors, and third party vendors for any injuries, losses or damages of any kind resulting from winner’s acceptance or use of a prize. For questions or for more information, please contact WalkBikeBerks at the above address or please call Nancy Kauffman at 610-582-6871 or Michele Barrett at 610-779-9702. Our First Annual Trail Cleaning. The Great Pennsylvania Cleanup is part of the national Great American Cleanup from March 1st through May 31st. Pennsylvania's focus day is Saturday, April 19th. Communities are being asked to organize and conduct local cleanups - recruit volunteers, promote your event, and report your results for inclusion in statewide and national cleanup totals. The theme of the cleanup is "Let's Pick It Up, PA!" Business and trade organizations, state government agencies, environmental and civic organizations, and many others, have all volunteered to assist local communities with conducting successful cleanups. PennDOT's regional and county offices will provide free supplies, including gloves, safety vests and trash bags to registered cleanup groups. Members of the Pennsylvania Waste Industries Association and other landfill owners have graciously donated landfill space for trash collected during the cleanup. Everyone who registers an event for the Great PA Cleanup will have access to a list of services and supplies available in their area. Environmental and civic groups will provide answers and assistance in organizing and preparing your cleanup. This was a post on Thunderhead's listserve. I thought it was worth sharing with the rest of the group. It was posted by Barry Zalph who is the Executive Director of Bicycling for Loiusville (www.bicyclingforlouisville.org). This was in response to adds circulating from State Farm (see here at http://www.streetsblog.org/2008/04/03/ad-nauseam-state-farm-and-the- humiliation-of-biking-to-work/ ). For someone driving 15,000 miles per year (AAA's "typical" figure), this comes to over $7800 per year. If the poor sap in the State Farm ad really can save $369 on insurance this year, that amounts to less than 5% of his annual driving costs - probably not enough to influence his car- versus-bike decision. Also, let's do the math on fuel costs. 15,000 miles per year divided by 25 mpg = 600 gallons per year. At $2/gallon, this costs $1200/year. At $3/gallon, this costs $1800/year. At $4/gallon, this costs $2400/year. In other words, a $1/gallon increase in gasoline prices results in a $600/$7800 = 8% increase in the cost of driving. Even adjusting this upward to account for the effect of rising oil prices on motor vehicle purchase, repair, and insurance costs, we see perhaps a 10% increase in driving costs for each $1/gallon increase in gasoline price. Bottom line: Driving is expensive regardless of gasoline prices! The viability of bicycling as a mode of transportation has nothing to do with gasoline prices! One final point: Going from inadequate daily physical activity to 50 miles/week of bicycling will, for many Americans, save nearly as much money on annual average health care costs as reducing gasoline use from 600 gallons/year to zero! Now, let's get out there and spread the gospel! " While your own mileage may be less then the "typical" average it's worth considering "ALL" the costs. Camp Hill homeowners who live along a major route between the Hoover Elementary School and the Bypass, will get free sidewalk and curb repairs and replacement under a new plan approved by Borough Council. Council decided last spring to use part of a $1 million "Safe Routes to School" state grant to pay half the cost of needed sidewalk and curb repairs in the project area. This is exactly why Safe Routes to School can work well in Berks County. Contact me today to find out how you can help your neighborhood create safer streets.